Hi! I'm Rhonie, and my mission is simple. Get ready to go "down under" with me! If you're familiar with dōTERRA's amazing oils (in the United States), you'll recognize some familiar names like Peppermint and Eucalyptus. But other names don't show up unless you carefully read the ingredients on some of the blends. Names like Litsea and Mānuka. Why? Because these oils aren't usually available for the American market – they're found in Australia. Litsea is great for antioxidant support. Mānuka promotes inner strength and helps keep skin clean and clear. But wait! For the month of August, these two "down under" oils are available free when you make a 200 Point Value order with dōTERRA. Any 200 PVs. That could be a new oil kit to get you started helping your family live better, or your assortment of products that you choose at wholesale prices. CONTACT ME so I can help you get started with your own wholesale account. Or if you already have an account, CLICK HERE and log in with your dōTERRA member ID. Also, to help you build up your 200 PVs, buy HD Clear (it thoroughly cleanses and purifies the skin – great for teens returning to school) for 10% off during the month. Need help getting started? CONTACT ME so you can stock up on these Certified Therapeutic Grade products! Buying backpacks, stuffing them with school supplies, trying on new outfits, deciding on the best school lunch items . . . I'm spending these next few days updating this page with BACK-TO-SCHOOL tips that I'm sure will help reduce the stress, get you excited, make you fit for the "Best. Mom. Ever." award! Ready? Let's go! I was glued to the screen watching this helpful video by Jeanette Fransen, a mother of several kids, including her special needs son (who loves to apply Frankincense to the roof of his mouth). 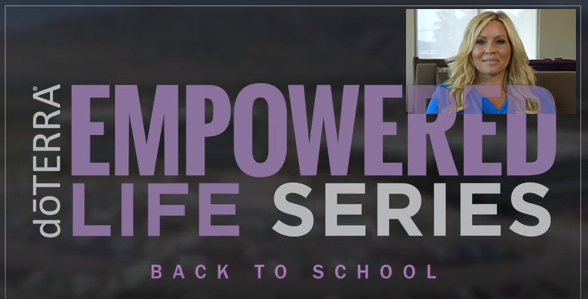 CLICK HERE to watch her back-to-school tips. CONTACT ME so I can help you order Frankincense in a handy bottle or as a roll-on. I'll educate you with even more tips about Frankincense and other oils! Let's Celebrate with Essential Oils! What can Essential Oils do for you? Learn what essential oils are, where they come from, how they can help support your specific situation, and how easy it is for you to get them in your home! I'm hosting a number of fun classes in my home in the month of August. You'll come to one, right? Can't wait to see you there! SIGN UP NOW for a fun, educational class in Kennesaw, Georgia! Can't come to a class? I'll be happy to meet with you one-on-one. I'm always excited to share the benefits of "getting oily"! CLICK HERE to learn more about my Consultation Package, personalized just for you! Can't wait to Educate, Encourage, and Empower you to get better!